If blakc plays g6 instead of g*f6 then after white plays h*g6 either that pawn or his f pawn will queen. I have seen this before so won’t comment except to say Chris’s solution is flawed. Ah I think white doesn’t need to play f4 and can instead just play g5 followed by f6. That way a pawn will either break through on the g or h columns. I agree with Mohammad, adding 6. Kc2. Black is now in zugzwang. 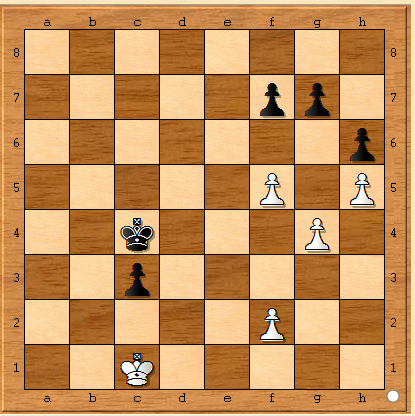 If he moves the king the h6 pawn queens, and the f pawn can’t move because it’s blocked by the king! if he doesnt take on f6 you end up with a passed pawn on f if he pushes the pawn. obvs you dont want to just leave it there. that is all about H pawn I believe so. Okay I see I missed that black can play f6 if white doesn’t play it first and instead plays g5. Oh well. Previous Previous post: The Hammer Train Rolls On!